A couple of weeks ago Nikki and I decided that we would invest in a tablet. No, even after all this time we still didn't have one! Because of all the recent and soon to come moving, not to mention that we will be without a studio or much storage space for art for quite some time, it just makes sense to downsize a bit. Going digital more allows us to be unrestricted by availability, or lack thereof, of materials, funds, and the aforementioned space. After a bit of research I opted to go with the Wacom Bamboo Fun. There was of course no doubt that I would be going with a Wacom, so it was just a matter of choosing the right model. The Bamboo Fun features just the right amount of drawing area, has a sleek and low-profile design, and is also USB powered. No batteries for me, thank you! So far I haven't had a ton of time to practice with it yet, but I'm sure it will be loved and used well by us for many years to come. During the little bit of time I have spent using the tablet, I have absolutely no complaints about it's functionality. It's an excellent product, and I do love the design of it as well as the design of its packaging. Overall, this is an excellently priced tablet. I got mine for an awesome $150, which I do believe is still current over at Buydig.com (viewable in cart only), just in case some of you are thinking of grabbing one too. The only thing I wish was a little better is the included software. It came with Photoshop Elements 7 and Painter Essentials 4. Neither of which are terribly great, but PE4 might get some use. 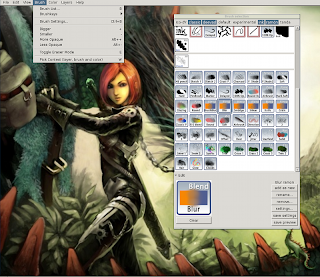 However, there is a great free and open-source program for digital painting called MyPaint that I do recommend grabbing for anyone with a tablet, and even those without who wish to do digital painting.